Definitive proof that the best things do (sometimes) come in smaller packages, Huda Beauty’s Obsessions Palettes are here – and they’re absolutely exquisite! 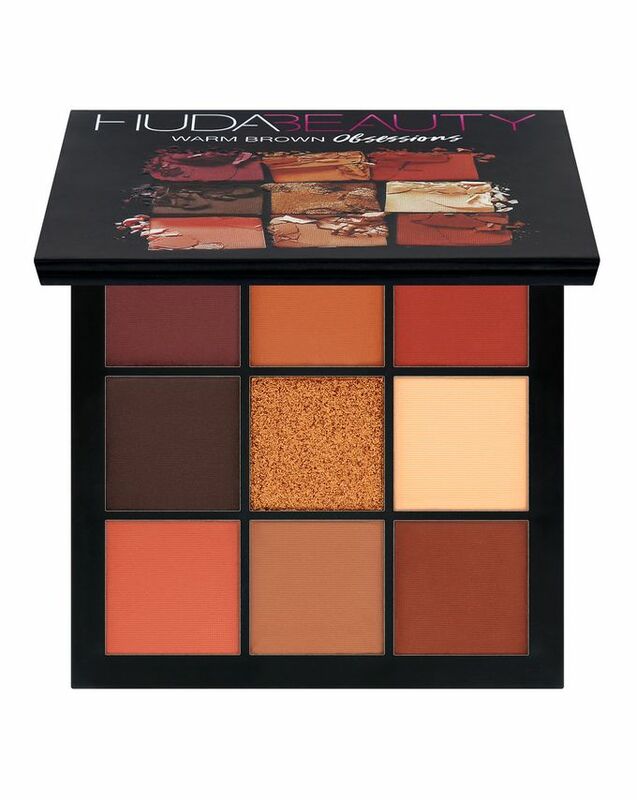 A dream come true for those Huda-holics who can’t squeeze their palettes into overstretched make up bags (or those yet to sample her game-changing shadows) this Warm Brown Obsessions Palette unites a spectrum of nine pigment-packed powders with matte and foil-effect textures in a fiery spectrum of shades for the ultimate sultry lid looks. Love your Huda palette but can’t fit it in your make up bag? Or just desperate to sample the shadows that have sent the beauty world into a spin? The answer has arrived (at last!) 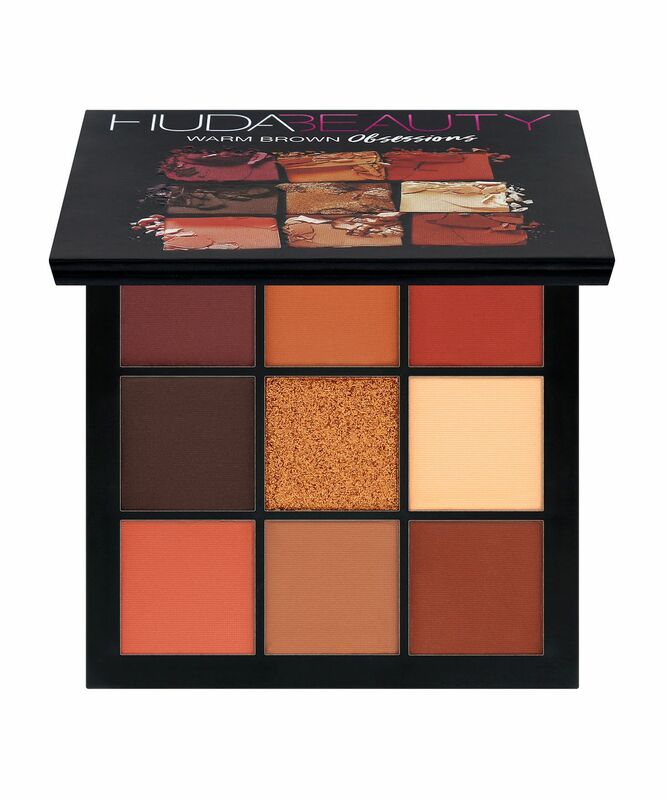 with Huda Beauty’s Warm Brown Obsessions Palette, a slimline edit of the most sought-after rich burgundy-red and flattering neutral shades – all you need to achieve an array of mesmer-eyes-ing warm brown eye looks. The ultimate capsule make up wardrobe, this unites nine ultra-versatile, buttery smooth shadows – one magnificent metallic surrounded by eight saturated mattes. We’re completely besotted with the range of hues and you're guaranteed to fall head-over-heels too – especially with the beautifully burnished copper hue, not to mention the rich burgundy red and creamy beige mattes. Apply with fingers or brushes for endless eye enhancement. Really nice colours I’m just not happy with size every eye shadow are very small i bought before a big pallet of the same brand so I thought the size of each eye shadow would be the same obviously less eye shadows but is not it’s so tiny. I ADORE this palette so much! I’m ALWAYS tanned and the pigmented reds and oranges mixed with the brown create an amazing everyday smokey eye look that’s subtle but makes the look. Pigmented shadows that come in practical shades and can be easily used for a glamorous/ night look. So I got this product in the JG box (which I loved) however, the reds are a bit patchy and don't blend out properly. I also had a hard time blending the dark colours with this palette. Other than that. I really liked it! Beautiful range of colours and great pigmentation. Definitely worth the hype. It is smaller than what I expected but overall it’s one of the best palettes I own! The eyeshadows are very pigmented and I really love the application of the foil eyeshadow. Beautiful range of colours and great pigmentation. However, there is a significant fallout. Also, don't know if it's just my palette, but the product is routinely breaking out from the pans. One colour came broken when I received this in the mail and it had just fallen everywhere, including onto other products in the package as well. Had to decant it in another pot. Another 2 have broken since. Been a bit difficult to manage. I do like the colour scheme and I do like the size for travelling. Some kickback not major. The pigment is okay. But I don’t think the £25 price tag is justified. The quality isn’t worth the price tag and the amount of product you actually get is tiny. The photos make the palette look a lot bigger in my opinion. I was shocked at how small it actually was. This is my second one of these palettes and they are fantastic! The colours in this one are beautiful and the blend like an absolute dream. They are the perfect size for travelling and fit perfectly within my makeup bag. Whilst they are compact, you get a really good amount of product and the mirror is a great size. The foil effect one in the centre is just perfect as well. The pigment is amazingg and it blends very well. Love the size it is handy if you travel a lot. Love the colors I wasn't disappointed. If you cant choose the right pallette just watch tutorials etc. A little bit hard to blend. Hate the chemical scent. If I am doing my makeup that is the only thing I am smelling. This is my first Huda Beauty palette & I’m really impressed with it. Pros: The warm browns, reds & orange tones all complement each other well; different looks can be achieved; small size & mirror makes it ideal for travel; it’s more affordable than the larger palettes; shadows feel buttery & smooth; easy to blend & great pigmentation. Cons: The shadows have a fair bit of fallout, the gold glitter shadow needs to be applied with your finger. Overall, the pros far outway the cons and I will be purchasing a couple of the other palettes in the collection. Perfect for anyone who wants to try Huda Beauty eyeshadows. A lot more affordable than the regular ones. Bought this one for my trip to Scotland and it's just the perfect size and it's got all the colours I need for a look! The formula is amazing too, very creamy and pigmented. I bought this palette to try Huda Beauty eyeshadow. The glitter is awesome, so good for green eyes. The dark colours take some time to blend, but it's to be expected. I'm sure it's made for people with warm-toned dark skin, if you're like me, pale and blonde, you won't be using it that much, there's too much red in the browns for it to be a good everyday look. I think the size of the palette is good to travel with, that way I can take one small neutral palette and this one. The mirror is ok. I'm thinking of buying some other Huda palette just for the glitters. I just receive this palette I think the colors are amazing. Easy blended nice price. I recommend it. Looooove these eyeshadows, the pigment, blends so nicely, colours, texture. Reading these reviews I cannot help but think I got a bad one. Just by putting your brush into the colours, there is plenty of kick up. Also when putting the colours on your eyes the fall out is horrible. I am so disappointed in the pigment as well, it's like there is no colour left after blending the colours onto your lid. This palette is gorgeous and swatch beautifully. However, the pigmentation of the matte shades is almost impossible to transfer onto the eyes. They don’t layer or build up well at all, in fact, they almost blend away. I also used the aubergine kind of shade on my lower lash line and had an almost instant allergic reaction (which has never happened to me before with any brand) my eye was stuck closed when I woke up the next morning. The big Huda Beauty palettes are talc free, so why do the smaller palettes have talc as the first ingredient when they’re just as expensive?! I do really like the gold metallic shade, but if that’s the only one I use, this palette was extremely expensive for one shadow. So disappointed as I adore the colours and the swatches were so promising. I’ll avoid Huda Beauty shadows from now on. I love this color. Realy nice and easy to apply. Small but worth every penny. Being a huge fan of Huda beauty products I had to buy this palette. Had quite high hopes when I ordered this. Honestly when I first opened my parcel I was quite annoyed because of the size of it. It's tiny but the pigmentation and colours are amazing. I actually am quite obsessed with it now. Reading so many negative reviews here I did get worried after I placed my order but ladies i must say it's worth every penny you pay. Once again Huda and her team has done a great job with this new product. it's a must have if you like Huda beauty and warm brown tone shadows. I died over this palette when it first came out, but sadly when I got it all I wanted to do was return it! used it once only and I don't find myself reaching for it anymore despite being a Huda beauty junkie. IT IS TINY, legit TINY, I'm glad I had a coupon code so I didn't pay the full amount. You're better off getting urban decay naked heat palette or a morphe palette instead. Bought three of these palettes, mauves and warm browns for myself, smokey for my daughter. Mauves are meh but the warm browns are fabulous. I'm cool toned, fair to medium with green eyes and these colours really work. Would give 4.5 stars with the half star deducted for the bit of fallout which to be fair all my Huda palettes suffer from. Knew it would be tiny but perfect for a cosmetic bag. I got this palette for my birthday last week and I absolutely love it, the colours are amazing and looks so much better in person that the pictures, very pigmented and blends quite well. You can create a variety of warm toned looks with just this palette perfect for the season. The only downside I would say is that the eyeshadows are a bit powdery and there is a bit of fallout too otherwise, it's a great palette and I definitely will buy another one! I opened up the eye shadow palette to see that this palette is tiny, I really don't think it is worth the £25 as it is the same size as my pinky finger. The pans are also tiny which is a real disappointment as I was expecting it to be a lot bigger considering the price. I was really disappointed with how small this was. It's about the size of a pressed powder product; saying this I gave it a go and the shadows are beautiful. Blends very nicely and is pretty pigmented which is a plus to the small size. I would recommend this if you want to try out the Huda beauty eye shadows without spending the big price tag of the larger pallet. Хорошо пигментированы, кремовая текстура,не пылят. На сайте вполне адекватная цена,они того стоят.Рекомендую. English translation - Well pigmented, creamy texture, does not dust drop. The site is quite an adequate price, they are worth it. I recommend. The pigmentations are absolutely brill. The only thing that is bad is that the palette is tiny, the pans are so small compared most palettes. Not worth the £25 for sizing but for the quality and pigment definitely. Wouldn’t find anything like anywhere else. The actual palette is really nice and so are the shades but it is SO small, especially considering that it is £25, quite disappointed at the size of the product for the fairly expensive price. I am in LOVE! it's perfect for travelling!i think the pigmentations is good! you get all colours you need to make tons of different looks with it! you can create day and night looks with it. love love love! I’ve seen loads of complaints that these are tiny, which they are. They’re probably palm sized. BUT, I don’t see that as a bad thing. I bought all four and I would be able fit all of them in my bag for a weekend away easier than one big palette. The pans are normal sized so it really is just compact. The pigmentation is amazing, tap with a brush once or twice and you get serious colour payoff. There is a tiny bit of fall out with deeper colours but that is to be expected. If you are thinking of buying this one don’t expect any actual brown shades though, they’re all red/purple. Bought this product on a whim and just got it today to find out it’s amazing. The colours are soft and velvety, while being easy to blend. The shimmer colour in the centre is gorgeous for a night time look. Overall, I would definitely recommend this palette. This palette fits in the palm of your hand so be cautious if you're expecting a massive full-size palette. This is my first Huda palette, and when I saw the launch message on the Cosmopolitan Snapchat story I knew I had to have it!. I stayed up till midnight to get it when it very first released and I got it. However, when I received it in the mail it wasn't quite what I was expecting. While the shadows are really great, the packaging is...disappointing. I was expecting the palette to be slightly larger, as well as the pans to be bigger too. I also expected some sort of plastic packaging etc, not the same type of packaging you'd get on a Barry M palette that's £5.99 from Boots. If the I wasn't as disappointed by the packaging it'd be 5 stars because the shadows truly are great. But honestly, you're paying £25 for the name. Although I absolutely LOVE Huda and her makeup line I was so disappointed when this arrived in the post this morning. Yes the colours are lovely but its certainly not as big as it is portrayed online. I did obviously know it was small but didn't think it would be THIS small. I’ve been wanting to try HUDA eyeshadows but didn’t want to fork out £56 so this product is perfect! The pigment in this case palette is amazing, a tiny amount goes a long way. The packaging makes the palette look deceptively small but the eye shadows are full size. I know many people are unhappy with the size, but honestly that's the plus for me. Yes, it is really small but that makes it perfect to travel with and because the packaging isn't plastic, it doesn't crack. The pigmentation isn't super crazy, and the colours probably won't blow you out of the water but that's exactly why this is my favourite everyday palette, because it's reliable, easy to use, and everything I need to create a simple warm eye look. Totally worth the £25 as I've hit pan! Revived this as part of Jamie Genevieve’s box. I love it and use it most day. Very pigmented. Huda Beauty warm brown obsessions palette. Never had a palette of eyeshadow shades that stay on as well as these do. Very small and smaller than they look in pictures, but very useful for those who like to travel. My new everyday palette. All shades are usable, and can also be used for a deeper look. I also love how there is only one shimmer (a universal gold) as I don’t use them often but I will now always reach for the gold shade. Overall amazing. I saw beauty gurus rave about this little palettes, I wanted them, but when I saw them in store and I was sceptical because of the size. I ended up deciding to buy two of them, the mauve and the warm ones, and I love them! I'm far away from being an expert, but they are easy to blend, and for being just 9 shades each, you can definitely do different eye looks. I'm going to bring them with me travelling for sure, and for sure I'm going to buy all of them at some point. You just look at this palette and your mouth waters. And in person, it’s so much better. I’ve heard people complain about how the palette is so small, however, each pan contains a very generous amount of product of very high quality, and I appreciate that less packing is used so it’s PERFECT for travel! A stunning palette and better for the environment! It’s a win-win. I love love love this pallet along with my others very easy to work with love the pigment and trust me when i say the glitter so smooth when applied on the lid. Being a very strong makeup fan specifically eyeshadows, I knew I had to try this palette and I have to say it exceeded all my expectations. Besides for the gorgeous colours, insane pigmentation I LOVE the size. The size is perfect not too large though not selling short on the actual product has many colours and is a perfect palette to own- definitely worth every penny would totally recommend. I'm far from a pro so I need something that's easy to work with and this is brilliant for me. (I have this and the smoky obessions one) So pigmented and easy to blend I definitely recommend this. I don;t usually go for higher priced items like this but I'm glad I did this time. They are small but the pans aren't any smaller than any other palette (low or high end) so don't let those comments fool you. In fact I think the size is a plus for travelling! I was quite disappointed when I got this palette. I wanted to get into the warm browns trend, but I think with this palette you get more into the red eyeshadows trend. You can make it work, but not all colours are wearable for everyday looks. The size of it was also smaller than I expected, it is just the size of a MAC quad. And one last point which I didn't like is that the eyeshadows seem to stain the skin when you try to remove them, and for the first time they stained a white bristles eyeshadow brush I have (it is from the velvet touch Japonesque brush set) and no matter how many times I wash it, the colour won't go away. Therefore, I am concerned about the quality of the eyeshadows whether it is good for the skin or if there are bad chemicals in them, as the shadows have a distinctive smell as well. With a hefty price tag of £25, I was expecting a lot from this palette, however, the size was smaller than my palm; very disappointing. This may be good for travelers. The fallout came quick and it merged with the other colours. They were quite hard to blend. What a shame! I love this palette the pigments are amazing. A little goes a long way with this palette it is definitely worth the prize. The only negative is that the size of the palette is small. I bought this palette as I’m going abroad and I love that’s it’s just the right size to travel with! And for 9 shades it’s £25, how can you go wrong! People may think it’s small but it’s regular sized pans. I love the colours out of this palette, the pigmentation is insane! I would recommend it! I love this pallet. The colours are pigmented, people saying how small it is but the eyeshadow pans are the same size as the larger Huda beauty palette, also to compare it’s the same size. And price as the Mac mini eyeshadow pallet, expect the eyeshadows in this are larger, plus I love the mirror in it, it’s handy for traveling. I bought this one and the smokey edition, which I also love, but the colour arrangement in this pallet and the quality of these shadows is something else. You get all the perfect red/warm brown colours to create a look plus an absolutely stunning gold which works so well with every colour in the palette. These have very good strong pigment but the colours are not for me will keep searching! Omg this palette is tiny literally smaller than my palm not worth the money. The colours are fab, but seriously. I just received this palette on Monday and the pigmentation is unreal. Colours are so blendable and easy to work with, and literally, last all day!! (I find that without expensive eye primers, most other brands disappear by the end of the working day) Love it!! All of the matte shades are really pigmented, and the metallic gold is gorgeous. Easy to blend and no fallout. Definitely, recommend. The only fault is the size of the palette it is quite small but worth the price. I just received this palette and it is amazing!! I love the colours on it and it just looks WOW. I bought three of the new Huda's eye palettes, each is wonderful and lovely, easy to blend, nice pigments, no falling outs, very elegant. It was so small compared to how it looks on photographs and there was a lot of fallout when used and did not blend at all when applied to my eyes. Pigmented when used with a finger but when used with brush I had to go back in about 10 times for the right colour. Huda eyeshadows have amazing pigmentation but feel slightly robbed in terms of pricing and the amount of product you actually get. The palette itself for £25 is massively overpriced considering the size is much less than half of a full Huda palette. Mine just arrived and I feel very cheated, was expecting half the size of a full Huda palette. Such a perfect palette and the pigmentation is truly amazing. Small and ready for on the go. I have this one and the mauve obsessions and both are great. Anyone that wants these, just buy them. I bought this pallet along with the mauve obsessions pallet. At a glance they look lovely and colour pay off is lovely. Mattes are a bit chalky wouldn’t describe them as buttery apart from the shimmers, however they all blend effortlessly. My only issue is they smell very chemically as soon as I opened the pallets I got a hint of a strong chemical smell. Is it just me or these pallets are scent less and only thing you can smell is chemicals. And I’m confused why the product is from China considering some of her other launches aren’t, kind of shady. The only reason I gave it a 4/5 is due to the chemical scent. Otherwise top notch pallets. Theses shadows are so creamy and blend like a dream. Very little fall out. Good range of shades to do everything from a minimalist day look to serious smoky eye. I’ll be investing in the other palettes asap. I’ve always wanted a Huda pallette due to the amazing pigmentation they supposedly have so when I saw in a Cosmo article that the UK had access to these new pallets I knew straight away that I wanted this one, it’s literally just arrived in the post today and I’m so in love with it. It’s amazing and worth every penny. I'd recommend to everyone! I didn’t buy any of the others but can guarantee the pigmentation will be amazing. I’m so happy I got this when it came. I’m obsessed it’s so pigmented, and such easy application. Ok, this one every girl have to buy it for her make up collection. This one has so much pigment it's an amazing eyeshadow palette. I don't wear make up everyday but because of these amazing colours I want wear it everyday. GIRLS TAKE THIS ONE YOU WILL NOT BE DISAPPOINTED. You guys will love this one and want to eat this one.